After our Moto E review, we are left with the lasting impression that this is one of the best value-for-money offers currently splashing against the waves of Android handsets that are flooding the marketplace, that's why we graced it with a 9/10 score. The phone might feature a "merely" 4.3" display, Snapdragon 200 processor, and a 5 MP camera on the back, but its performance is well-balanced, its battery life is stellar, and above all - it costs just $130 without any subsidies, so what's not to like here. To top it all off, Moto E comes with the latest stock Android 4.4 KitKat, and its interface speed trumps even the mighty Galaxy S5 in the daily interaction with the handset. Now, what can make such a fine handset even better? Well, the all-time geek favorites - unlock, root, and install recovery, which will open the floodgates for tweaks, custom ROMs, and general Moto E improvements on all fronts. 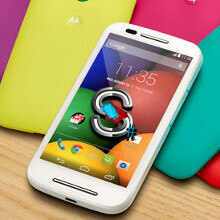 Here's what you need to do in order to gain full access to your Moto E handset's abilities. Back up your phone first ! Go into the main menu, and if you see the SuperSU icon on the right, then you are rooted! I hope the up-comming Moto G LTE is this easy to unlock/root/recovery. I wish Samsung gave this option. You could unlock your device at their site but when you do your warrantee is voided. This would not make them liable for any bricks and keep the people that want unlocked bootloaders on at&t and Verizon happy. Just install the app from the Play Store and use an apk extractor. If you're unable to install from the Play Store (incompatable phone/version/provider), just do a google search, and there's a good chance you'll be able to find one. If not, head over to xda and make a request here:http://forum.xda-developers.com/showthread.php?t=2392504 Just keep in mind that they won't help you with free/hacked versions of paid apps. Cheaper phones are even more important to root, because that's the only way you can manage the limited space on this device and actually make use of the space on your microSD card for apps (instead of just media).